Real Estate sales in Highlands and Cashiers area had a sharp rise in sales during the month of May, 2016. However, before you start jumping up and down with joy you may like to know some determining factors and other important data. 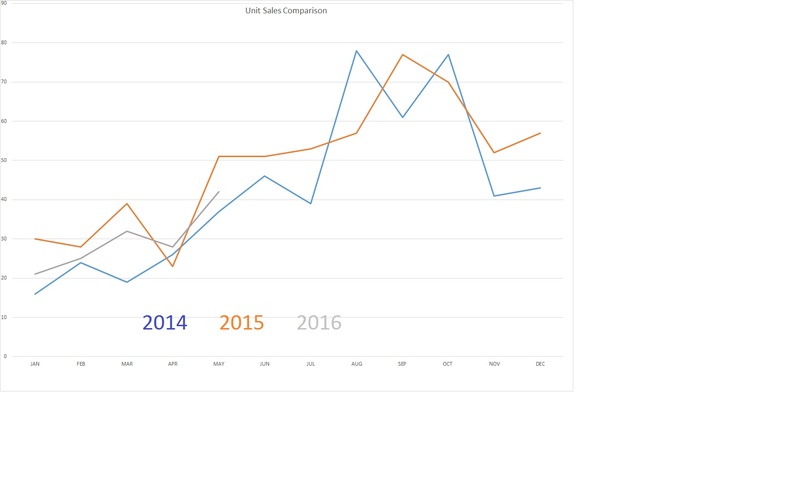 In reviewing the graph above, you will notice that sales tend to rise during the summer months, when the majority of buyers in this area make their purchases. The recent rise in sales for May is typical and to be expected. 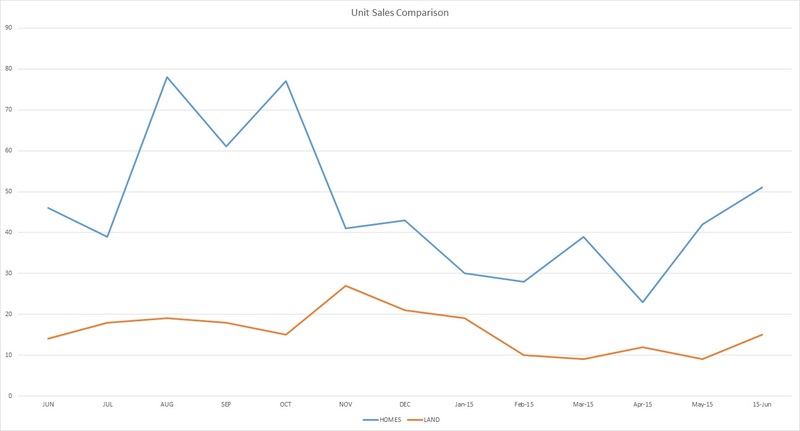 However, one should also note that May 2016 unit sales were below May 2015, but still above May 2014. What does all this mean? There’s really not that much to get excited about. While many surrounding markets have been doing very well, the Highlands/Cashiers area is a different type of market. Since there is little to no industry in this area and the majority of visitors are seasonal, this is a second home or luxury market. From the data in the chart we see things as maintaining status quo. What can we expect? Do the math. The Highlands/Cashiers Board of Realtors (HCBOR) sold 42 homes in May. This also includes Lake Glenville, Sapphire, Toxaway and surrounding areas. Mind you, this is 42 homes out of all the agents and offices in the HCBOR. Now, add the fact that there were an additional 312 listings added, bringing the total inventory to 1,400 homes (land is not included in this figure). So, 1,400 homes in inventory and selling 42 homes per month, it would take over 33 months to sell all these homes. That’s nearly 3 years worth of inventory. Little wonder that the average Days On Market (DOM) is at 506 days. While the Highlands-Cashiers Real Estate Market is very unique, you can still sell your home. However, one should not expect to receive the price they may have paid in 2007 or 2008. Remember, you are up against a lot of competition, what we call “substitution.” In other words, for what does a similar home sell. True, another home may have been listed at one price, but where did it sell (closing price). Notice the chart above. 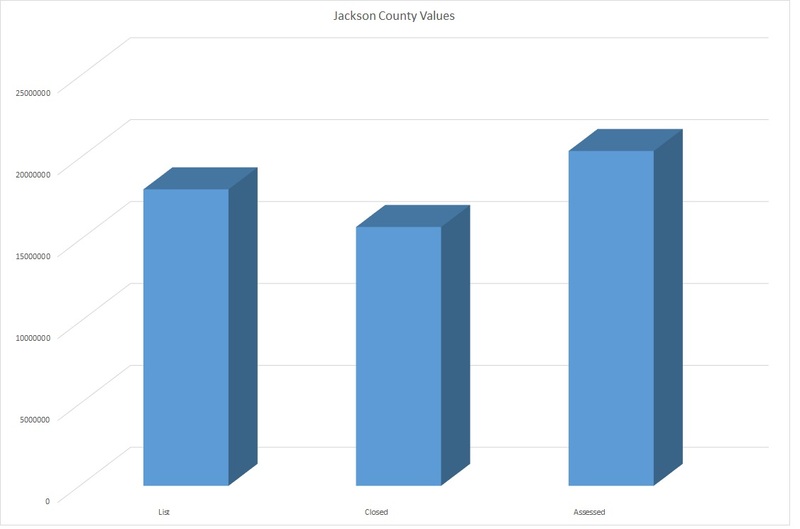 The first column is the “Listing Price” volume of homes sold in Jackson County through the HCBOR. The next column is the volume where these homes actually sold (closing price). The last column is where the homes county tax assessment had their value. In a strong market, there are bidding wars on property. “Closing” price is usually higher than “Listing” price. In our area, we see the opposite to be true. If you want to sell your home any time soon in this market, one should expect to price their home so as to attract buyers. Pricing like everyone else means you will have a lot of competition and you may be sitting on the market for some time to come. Many have the view that buyers will, “beat me up on price so I’ll price high to come down.” This could be a faulty strategy in that if you’re priced even a little high, buyers may tend to look elsewhere. Whereas, if you price to attract buyers, you are more likely to see more people considering your property over your competition. Let’s face it, everyone, including your Real Estate Agent, wants to get the most out of your property. You want it because it’s your money. Your Agent/Broker wants it because it means their payday. However, one must be objective in looking at market trends and what the market is doing. We may look at this another way. Let’s say you bought stock at $50/share. The market went down. Now, those same shares are only worth $35. So if you want to sell, what can you expect to get for those same shares? It’s the same way with homes. Buyers drive the market. One can not expect to get more just because they feel it is worth more, because they may have paid more or because that’s what they want. 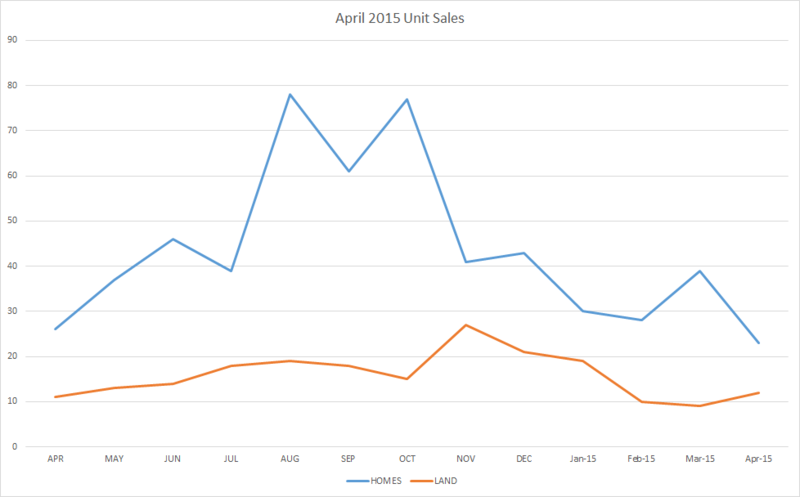 Total homes listed in Highlands/Cashiers MLS: 1400 – Another increase in inventory from April. Homes Sold This Month: 42. 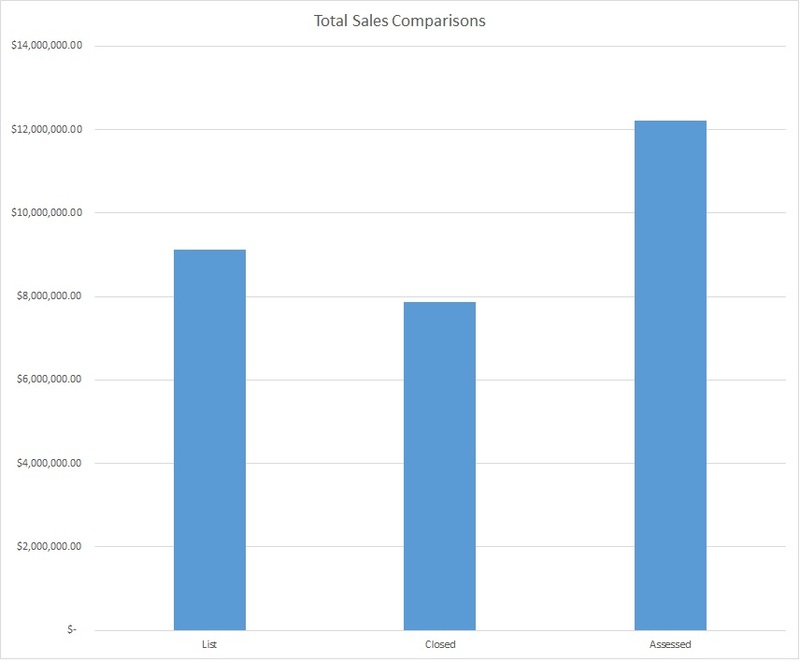 Average Sales per Month 1 Year Average: 46 Since we have a “short” selling season, we use the 1 year average sells per month for statistical purposes. 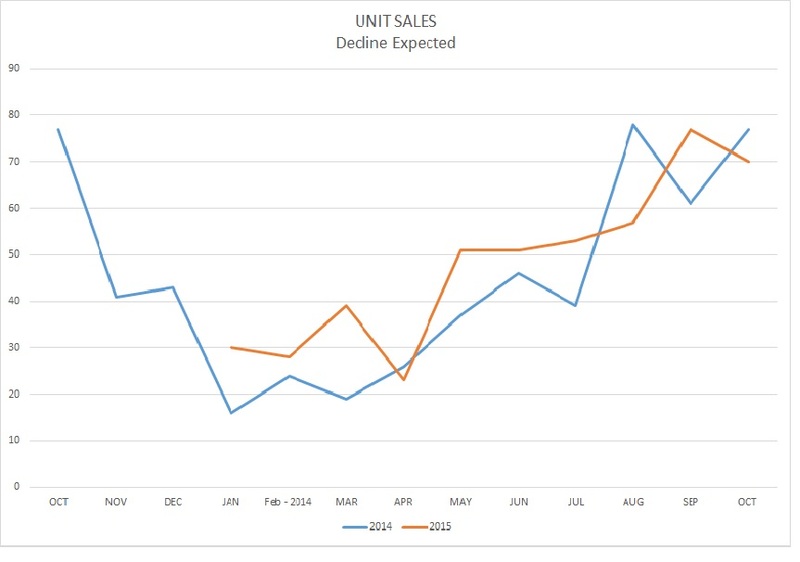 Inventory: 30 months – Here the YOY (Year Over Year) Sales/month is used since our selling season varies greatly. This gives a more accurate since of inventory. Still, a healthy market is considered to have 6 months or less. Median Sales Price: $332,500 – This is a good number for this area. Our neighboring MLS is at $150,000. Average List/Sell Ratio: 89.14% – In other words, properties sold at nearly 11% less than where they were Listed. Synopsis: This does not appear to be a strong market. As inventory increases for the selling season, pricing must be competitive enough to attract buyers. The List/Sell Ration is an indicator that many homes may be priced to high. As a result, homes may expect to stay on the market for some time to come. Total listed in all MLS: 1272-This number continues to rise. Inventory: 106 months. Low numbers of units sold and added listings will cause this number to continue to rise. Synopsis: Land is very difficult to sell. Large inventory of homes makes it less expensive to purchase a home than to develop land with well, septic, clearing, roads and build a home. We have nearly a 9 year inventory of land. 41% of home sales ranged from $200,000 to $499,999. This continues to be the major portion of market sales. 19% of home sales ranged from $500,000 – $749,999. This was another significant rise in homes in this price range. 17% of sales were above $1,000,000. This is a slight increase . Sellers, you may be anxious to sell your home. However, if you’ve been on the market for a while, you may want to consider adjusting your price. No amount of marketing will sell your home unless you are in the “market” price. Buyers, as surrounding markets have become stronger and continue to show positive signs, continued delay in making a purchase in this region may mean missing an opportunity at some of the lowest prices we’ve seen in many years. Don’t be afraid to make an offer. Getting Ready for Busy Season! Home sales declined but not a reason for panic. The year over year data suggests we are on target for home listings sold in April. This continues to show the current market as fairly stable. This is a positive sign for listings in the Highlands/Cashiers area real estate. Total homes listed in Highlands/Cashiers MLS: 1347 – Inventory showed a sharp increase of nearly 260 homes. This shows that many homeowners that may have had their homes off market during the slower season have now returned their listing to the market. This increases competition for sales, but the number of homes sold also tends to rise during the summer months. Homes Sold: 23 – This is down from the previous month, but in line with Year Over Year numbers for April. 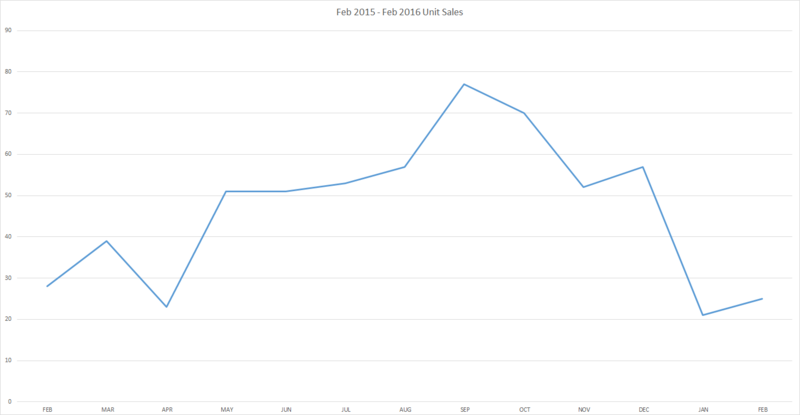 Average Sales per Month 1 Year Average: 44 – Last month was 45. Little change in the overall market. Inventory: 30 months – This is a very large inventory. A contributing factor to this is the 24% increase of listings that came on the market. DOM: 497 – This has dropped. However, the listings that are coming back on market now after the winter will no doubt effect this number. .
Average DOM (YOY): 450 – This number helps us to see that sellers should not expect a quick sale on their listing. Median Sales Price: $275,000 – These are the listings that sold in the middle of the market. In other words, there’s just as many homes being sold above and below this mark. This is the one that hits in the middle. 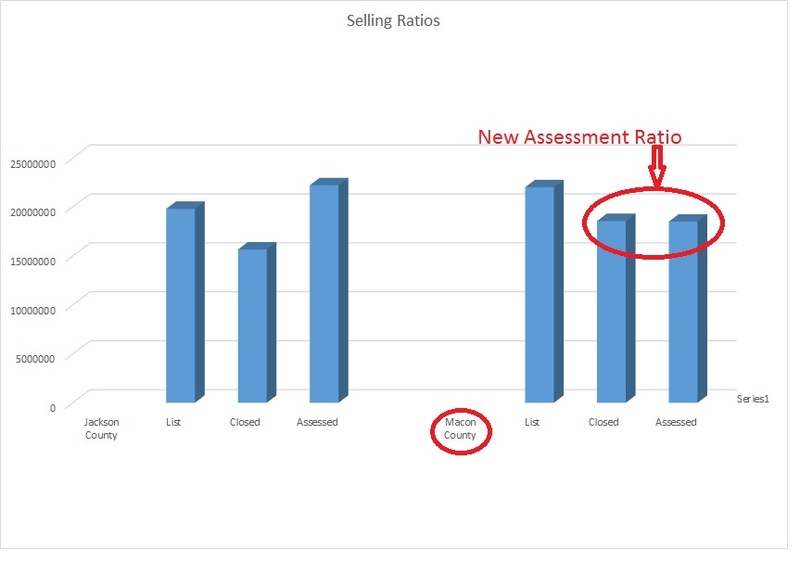 Average List/Sell Ratio: 88.16 – It would seem that many homes may still be overpriced. Overpriced homes typically stay on the market longer. Your agent should give you realistic numbers and not “Buy” your listing. If you would like to know, “How Much Is My Home Worth,” get a Comparative Market Analysis from your broker or hire an appraiser. Do Not go by tax assessment. You can also request a FREE Comaprative Market Analysis for Highlands, Glenville and Cashiers area here. Synopsis: While this region has not shown the same growth in numbers as other areas across the nation, the summer months do hold promise for those desiring to list their homes. Listings need to be on the market now to beat advertising and other deadlines. Syndication can take time so sellers should not hesitate to contact a top listing agent. Buyers should not hesitate to make an offer. As the summer months typically drive up sales, so the prices may go as well. Land Units Sold: 12 – There is not a lot of land being sold. Total listed in all MLS: 1230. This is another increase in land parcels available. No expectation of increase in property value. Inventory: 77 months. Slight increase due to more parcels being added. Average DOM: 532 – Slight decrease. Sellers should not expect that their properties will move quickly. Average List/Sell Price Ratio: 73.29 This is a HUGE margin. In other words, land sold (on average) for 73.29% of what it was listed for. There is no real demand for land, at present. Buyers expect much lower prices on land. Sellers that want to sell their land may want to discuss with their agent about lowering the price. Synopsis: There is no real demand for land, at present. This will continue to keep prices down. This is still a great market for buyers. As we move into our summer months many will be returning to visit our area. 40% of home sells appear to be 2-3 bedroom homes priced between $200,000 – $400,000. Your agent should be candid and discuss realistic pricing, as indicators show that many properties are still over priced. A top agent should be able to provide you with all market data and trends. If you desire a more up-to-date trend on the market area of the Highlands/Cashiers Board of Realtors please feel free to contact Rick to make a specific report for your area of our MLS (Sapphire, Norton, Glenville, Highlands, Toxaway, Clear Creek, Breedlove, etc). This material is based upon work performed by Rick Creel, Broker. It is intended to provide an overall view of the real estate market for Highlands, Cashiers and surrounding areas of the Highlands/Cashiers Board of Realtors. It is comprised of data from the HCBOR and NAR for this MLS. Any opinions, findings, conclusions, or recommendations are those of the author and do not reflect the views of any others. There can be no assurance that this information is complete, accurate, or includes all available market data; all information is subject to change. Users of this information are advised to consult with their financial experts about the interpretation and usefulness of information contained herein. It is unlawful to duplicate or distribute the information contained in these reports. For more information or to consider listing your home with an agent CLICK HERE. A top listing agent will show you the facts.